Help kids learn in the best way possible – with the help of diagrams. Encourage them to draw and understand the science behind every phenomenon so that it is crystal clear in their minds. 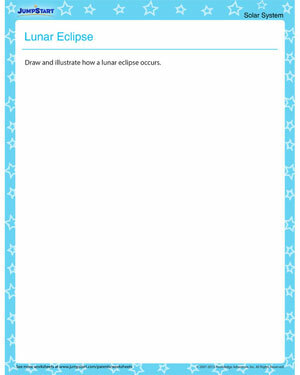 ‘Lunar Eclipse’ is a free Solar System worksheet that requires kids to draw the scientific phenomenon of a lunar eclipse and label the important parts like umbra, penumbra, etc. Download the Solar System printable for kids and indulge in a cognitive drawing activity.